Solar illumination of the GOES-17 Advanced Baseline Imagery (ABI) was at a maximum on 14 April, so that the effects of the Loop Heat Pipe that is not operating at its designed capacity (and therefore cannot keep the ABI detectors as cold as preferred) were at their worst. (This image of the predicted Focal Plane Temperature from this blog post shows the mid-April peak to be warmest). The animation above shows that only Band 14 (11.2 µm) was able to send a useable signal during the entire night. The Band 14 data are biased, however. The image below compares GOES-16 and GOES-17 temperatures over a region on the Equator (here, from the GOES-17 perspective, and here, from the GOES-16 perspective, from this website) equidistant between the two sub-satellite points (75.2º W for GOES-East, 137.2º W for GOES-West). GOES-17 slowly cools relative to GOES-16 (assumed to be ‘truth’) before undergoing a series of cold/warm/cold oscillations relative to GOES-16. So while a useful signal is preserved, algorithms that rely on threshold temperatures, or brightness temperature difference fields (such as the 3.9 µm – 11.2 µm Brightness Temperature Difference), would likely produce unexpected results. ABI Band 14 (11.2 µm) temperature differences, GOES-17 – GOES-16 on 14 April 2019 (Click to enlarge). Representative Band 14 images during a time largely unaffected by Loop Heat Pipe issues are shown at top. Loop Heat Pipe issues should slowly subside over the coming weeks. ‘Predictive Calibration’ is likely to be in place by the time the (Northern Hemisphere) Autumnal Equinox arrives. This will extend the useful signal for the ABI channels. One might even conclude that this current episode will have the worst impact on useable imagery from the ABI. Polar2Grid allows users to create true-color imagery from VIIRS (Visible Infrared Imaging Radiometer Suite) data from Suomi-NPP or NOAA-20. This tutorial will take you through the needed steps. Step one is to decide when you want the data; the ways to determine when a Polar Orbiter overflies a particular point are outlined in this blog post, that points to this website. For this blog post I’ve chosen Missouri. The image above shows a True-Color image over Missouri at about 19:42 UTC on 9 April 2019. To create true-color imagery, Polar2Grid requires VIIRS M-Bands 3, 4 and 5 (Blue (0.48 µm), Green (0.55 µm) and Red (0.67 µm), respectively, all with 750-m resolution); click here for a list of all VIIRS bands). If the VIIRS I-Band 1 (at 0.64 µm) is present in the directory, then that image is used to sharpen the resultant image. Polar2Grid CREFL software also performs a simple atmospheric Rayleigh scattering removal; smoke and haze will still be apparent in the imagery, however. To create the imagery above, first order the data from NOAA Class. (Steps to follow are shown here). Download the data into a unique directory. We are going to remap these data onto a map centered on Missouri, and for that to happen, Polar2Grid needs mapping parameters. These can be generated automatically with the p2_grid_helper.sh script that comes with Polar2Grid software. From the bin directory, I entered this command to put the grid parameters in a file . This adds a map to the image, then converts it to the png file (j01_viirs_true_color_20190409_194226_missouri.png) that is shown above. After doing the same steps for a series of clear days in the midwest (09 March 2019, 15 March 2019, 21 March 2019, 26 March 2019, 31 March 2019), and annotating and concatenating the images in an animation, the greening up of Spring is apparent. See below. Special shout-out to Dave Hoese, SSEC/CIMSS, for crafting software that is so easy to use to produce excellent satellite imagery. Polar2Grid is Python-based software created at CIMSS/SSEC to process data from Polar Orbiting satellites into useful imagery (or into files that can be imported directly into the National Weather Service Advanced Weather Information Processing System (AWIPS) for display). (You can download it for a linux machine at this site.) This tutorial will describe where to find downloadable NOAA-20 (or Suomi-NPP) data, and how to create imagery. Thus, this blog post is similar to earlier blogs posts (here, and here) that described how to use Geo2Grid for Geostationary Satellites. Earlier blog posts showing Polar2Grid output are here and here. The first thing required at the NOAA CLASS site is to request the data that you want to access. There is a long drop-down menu (‘Please select a product to search’ is its original title) on the CLASS front page; use the drop down to select ‘JPSS Visible Infrared Imaging Radiometer Suite Sensor Data Record (VIIRS_SDR)’. This tells CLASS that you want VIIRS data from either Suomi NPP or NOAA-20. Click on the ‘Go’ button to the right of the menu bar. That takes you to a selection page. It is necessary to log into the CLASS system. When you order data, an email is sent acknowledging the order, and a follow-on email once the data are available specifies how you can download it. The log-in tells CLASS where to send the emails. Polar2Grid expects the data to be ‘de-aggregated’, so you must set User Preferences in NOAA CLASS to do this. Click on the ‘User Preferences’ link in the table on the left-hand side of the main NOAA CLASS Page (after you have logged in). The location is shown below in the toggle. NOAA Class Front Page after logging in as a user. Note the ‘User Preferences’ Tab, circled in red. Data requests require you to know something about the orbits of the satellites — so you can narrow down the amount of data you want. This handy website shows where all polar orbiters have been flying. Follow the links to the specific satellite and location; for example, if we’re interested in NOAA-20 orbits over Hawai’i on April 8 2019, this map shows them. The map suggests requesting NOAA-20 from 23:20 to 23:30 on 8 April 2019 will give a good view of the islands. The data we will request are I01, I03 and I05 (0.64 µm, 1.61 µm and 11.45 µm, respectively). In addition to requesting the Sensor Data Records, it is also necessary to request, near the bottom of the page, the ‘VIIRS Image Bands SDR Ellipsoid Terrain Corrected Geolocation (GITCO) (public)’. These geolocation files are used by Polar2Grid to navigate the imagery. ‘GIMGO’ and ‘GITCO’ refer to geolocation data; even though you only requested GITCO fields, CLASS will give both. That’s okay. SVI01, SVI03 and SVI05 hold data from bands I01, I03 and I05, respectively. The ‘j01’ tag signifies data from NOAA-20, or JPSS-1. For the 20-minute request I made for each band, I received 8 of each type of file. The polar2grid.sh shell script is within the bin directory of the Polar2Grid software that emerges after you g-unzip and untar the file from the Polar2Grid download site. The command results in a .tif file with highest-resolution grey-scaled imagery. The image below (converted from .tif to .png) shows the scene. It’s quite large: 6876×7616 pixels! It’s useful to add maps to the imagery, and that is done in Polar2Grid after the .tif file has been created by using ‘add_coastlines.sh’, also in the bin directory. The command can add coastlines (–add-coastlines), borders (–add-borders), rivers (–add-rivers) and lat/lon lines (–add-grid). Lat/Lon lines can also be labeled. When maps are added to the .tif file, the image is also saved as a .png file so the original scene is not overwritten. You can use the -o flag to rename the new file. The command I used is shown below. The animation at the top of this blog post shows all three images (I01, I03 and I05) sequentially. Final note: Infrared imagery by default is not color-enhanced, and built-in enhancements are not (yet) available. Polar2Grid does support creation of colortables, however. That will be the subject of a future blog post. GOES-16 Cloud Top Temperature, 1345-1620 UTC on 2 April 2019 during Mode 3 Scanning (Click to enlarge). Mode 6 scanning with 10-minute full disk imagery started at 1600 UTC. The most common scanning strategy for GOES-R satellites since GOES-16 became operational has been “Flex” Mode, Mode 3: During each 15 minutes, 1 full disk, 3 CONUS and 30 Mesoscale scans are achieved (Link showing Mode 3 Scanning. This YouTube Video shows Mode 3 Scanning with two adjacent mesoscale sectors). (Mode 4 — continuous 5-minute full disk imagery — has been implemented as well, as noted here). In early 2014, before launch, researchers at NOAA’s Advanced Satellite Products Branch and CIMSS in Madison, Wisconsin suggested that some of the time where the ABI wasn’t scanning (The white space in this graphic) could be used to provide larger CONUS (or PACUS) scans. This didn’t happen, in part because it changed the dimensions of an ABI sector. 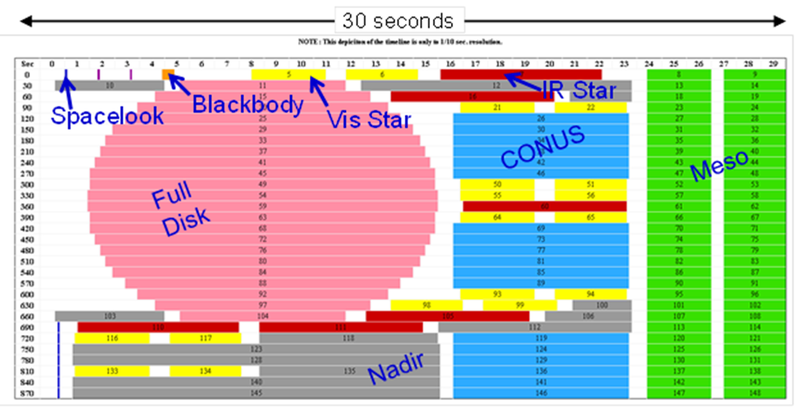 However, in August 2014, an email exchange with the lead ABI instrument designer from Harris Corporation led to the concept of using the extra time instead to increase the cadence of full disk imaging from every 15 minutes to every 10 minutes in the “flex” mode. (Click to see a ‘Time-time’ chart of Mode 6 for GOES-16, and for GOES-17; You might notice that GOES-16 and GOES-17 have slightly different Mode 6 scanning strategies. Mode-6M for GOES-17 differs because of the timings of different calibration looks meant to mitigate errors associated with the faulty Loop Heat Pipe (link 1, link 2, link 3). Changes were need to in the ground system to support this new scan mode, and those changes are now operational. The change to 10-minute full disk imagery matches the scanning of JMA’s AHI imager (and it will match the next generation EUMETSAT imager as well). It also gives the finer time resolution in the full disk domains for monitoring convection, fires, volcanic ash plumes, turbulence, etc., in regions outside CONUS and PACUS scans. In particular, Alaska region of the National Weather Service receives full-resolution Alaska sectors created from the full-disk imagery, and those sectors will now switch from a 15-minute cadence to a 10-minute cadence. All of Central and South America will now also have imagery every 10 minutes! This page at the goes-r.gov website has more information on scanning strategies. You can also find more information about scanning schedules and scan sectors here. Many Baseline Products will also adopt the 10-minute cadence. For example, compare the GOES-16 Baseline Cloud Top Temperature imagery above, from April 2, with Mode 6 scanning and 10-minute temporal resolution at the end of the animation, with the GOES-16 Baseline Cloud Top Temperature with Mode 3 and 15-minute temporal resolution below from April 1. (An animation with Mode 6 scanning at the end showing Band 13 “Clean Window” 10.3 µm imagery is here). Additional Full Disk animations covering a 6-hour period — 3 hours before/after the 1600 UTC Mode 6 activation time — are available from GOES-17 (Visible | Water Vapor) and GOES-16 (Visible | Water Vapor).